FACT CHECK: Is the 'Haiku Bird' a Real Creature? Is the ‘Haiku Bird’ a Real Creature? The four-legged, banana-eating, immortal pet of a deity is a remarkable specimen indeed. Photographs document the existence of the "haiku bird." Alas, these photographs do not document the existence of a four-legged, banana-eating, immortal pet of a deity. Photographs of this “haiku bird” actually show a posable art doll created by Deviant Artist CMWyvern. Friendly PSA! A previously unwatermarked version of this image has been floating around the internet and been used as youtube clickbait, gone viral on fb, etc! I, CMWyvern, am the creator of this creature, and it is not Photoshopped nor is it a Pokemon. Please keep on sharing my work – but I really do appreciate being credited when you do! Cloud Antelope is a one of a kind posable art doll, 17” long and 9.5” tall. Her head, lower legs, and scales are sculpted from polymer clay and painted with acrylics. Her faux fur is hand trimmed and colored. Her horns and legs have an armature inside, so they are very sturdy despite being long and thin. 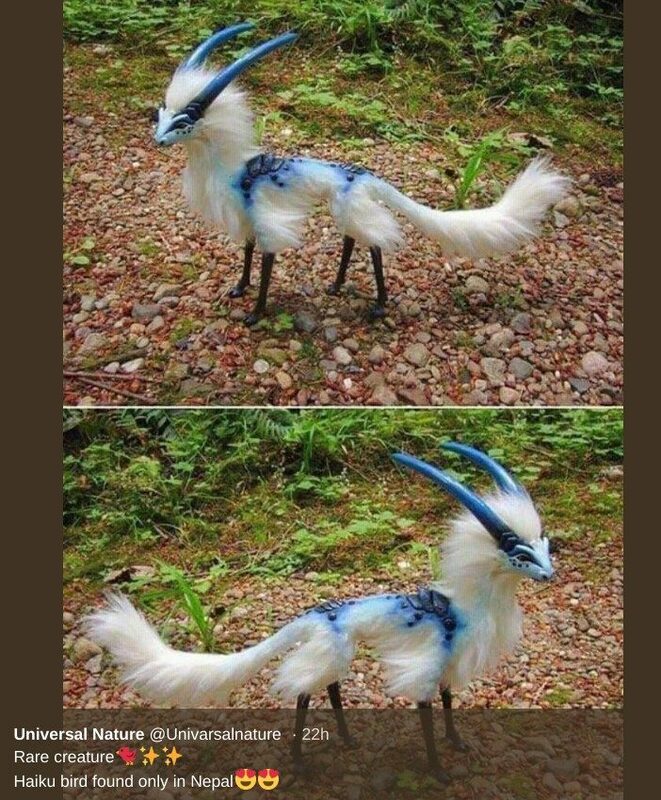 This is not the first time that an artistic doll or figurine has been mistaken for a genuine image of some sort of mythical or suspiciously cute creature. We’ve previously covered artistic creations that resembled a short-tailed weasel, an adorable bunny, the “world’s cutest rodent,” baby owls, a baby platypus, monkeys from Madagascar, furry albino tarantulas, and the marvelously mythical marbled faurk. Deviant Art. 25 August 2014.